Heksagonalni oblik i cinkblend su polimorfi koji nemaju inverzionu simetriju. Ova i druge osobine simetrije kristalne rešetke rezultiraju kao piezoelektricitet) heksagonalnog ZnO i cinkblenda, te piroelektriciteta heksagonalnog ZnO. ↑ Takahashi, Kiyoshi; Yoshikawa, Akihiko; Sandhu, Adarsh (2007). Wide bandgap semiconductors: fundamental properties and modern photonic and electronic devices. Springer. str. 357. ISBN 3540472347. http://books.google.com/?id=j_HEazhVxoMC&pg=PA357. ↑ 9,0 9,1 Wiberg, E. and Holleman, A. F. (2001). Inorganic Chemistry. Elsevier. ISBN 0123526515. ↑ 11,0 11,1 Spero, J. M.; Devito, B.; Theodore, L. (2000). Regulatory chemical handbook. CRC Press. ISBN 0824703901. ↑ Nicholson, J. W; Nicholson, J. W (1998). "The chemistry of cements formed between zinc oxide and aqueous zinc chloride". 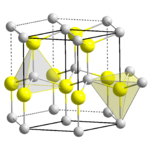 Journal of Materials Science 33: 2251. doi:10.1023/A:1004327018497. ↑ 13,0 13,1 Ferracane, Jack L. (2001). Materials in Dentistry: Principles and Applications. Lippincott Williams & Wilkins. str. 70,143. ISBN 0781727332. http://books.google.com/books?id=5uvuvNKpIkQC&pg=PA143. ↑ Park C.-K., Silsbee M. R., Roy D. M. (1998). "Setting reaction and resultant structure of zinc phosphate cement in various orthophosphoric acid cement-forming liquids". Cement and concrete research 28 (1): 141–150. doi:10.1016/S0008-8846(97)00223-8. ↑ Greenwood, N. N.; & Earnshaw, A. (1997). Chemistry of the Elements. Oxford: Butterworth-Heineman n. ISBN 0-7506-3365-4. ↑ International Occupational Safety and Health Information Centre (CIS) Access date January 25, 2009. ↑ Zinc oxide MSDS. Access date January 25, 2009. ↑ Özgür, Ü.; Alivov, Ya. I.; Liu, C.; Teke, A.; Reshchikov, M. A.; Doğan, S.; Avrutin, V.; Cho, S.-J. ; Morkoç, H. (2005). "A comprehensive review of ZnO materials and devices". Journal of Applied Physics 98: 041301. doi:10.1063/1.1992666. ↑ 19,0 19,1 Hernandezbattez, A; Gonzalez, R; Viesca, J; Fernandez, J; Diazfernandez, J; MacHado, A; Chou, R; Riba, J (2008). "CuO, ZrO2 and ZnO nanoparticles as antiwear additive in oil lubricants". Wear 265: 422. doi:10.1016/j.wear.2007.11.013. ↑ 20,0 20,1 20,2 Porter, F. (1991). Zinc Handbook: Properties, Processing, and Use in Design. CRC Press. ISBN 0824783409. ↑ Dal Corso, Andrea; Posternak, Michel; Resta, Raffaele; Baldereschi, Alfonso (1994). "Ab initio study of piezoelectricity and spontaneous polarization in ZnO". Physical Review B 50: 10715. doi:10.1103/PhysRevB.50.10715. ↑ 22,0 22,1 Brown, H. E. (1957). Zinc Oxide Rediscovered. New York: The New Jersey Zinc Company. ↑ Brown, H. E. (1976). Zinc Oxide Properties and Applications. New York: International Lead Zinc Research Organization.